Gray land beneath gray sky. They stretch beneath a sun the color of dried blood, always waiting at eternal late afternoon. The vast flatness is broken by occasional low, worn, hills, or bisected by a flowing river of red dust. Copses of trees appear sporadically, as gray as the grass, as gray as the hills, as gray as the sky. The only colors here are iron gray and rust brown. Oh, and blood red. Briefly. When the wolves have taken another soul. These are the Iron Plains. This layer of the Abyss most strongly resembles mortal flatlands, the type of area often turned to farming or other forms of settlement. The layer is, however, formed not of soil and wood and flesh, but of iron, and nothing but iron. Iron ground gives birth to iron grass, which grows around clumps of iron trees and provides cover over the slowly rolling iron hills. There are rivers here, and a few small lakes, where the "water" is extremely fine flakes of rust. Unlike the Mines, however, there is no large scale demonic industry here, as the metal of this realm tends to become weak and useless when removed; a few veins of usable ore exist, but it takes extraordinary skill to identify them. It is claimed by several Princes as part of their realms, but despite these conflicting statements of ownership, no one seems eager to exert the resources necessary to truly possess the Plains, so they remain mostly in their "natural" state. The Plains Of Iron are locked in an unending near-twilight, a late evening glow that causes long shadows and dim light. The "sun" is a dull, dying, reddish brown, blotchy and ill-formed, and looking upon it is vaguely disturbing in ways not easily put into words. The temperature is often cool, perhaps 40 degrees,but the Abyss is a place of chaos and madness, after all, and there are strange storms of ice and fire which sweep the Plains randomly — see below, in "The Crunchy Bits". The ground is harsh and hard, as one might expect, and the blades of grass are… well, do the math. They’re made of iron, after all. Overland speed is reduced by three for anyone travelling along the ground, and falling damage gains "Brutal 2". 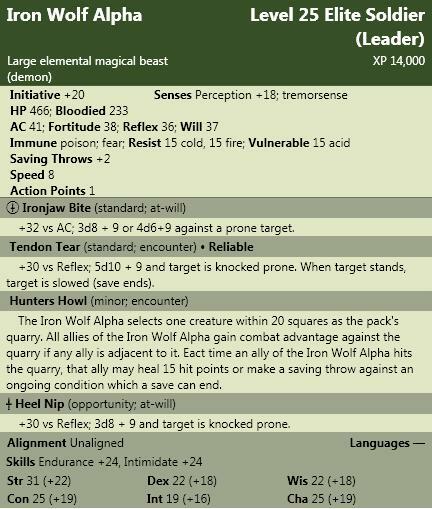 Furthermore, anyone without the Elemental or Construct keywords who is pushed, pulled, or slides while prone takes 1d6 points of damage per square moved. It is also dry. Any Endurance checks to resist thirst have their DCs upped by 3, and similair modifiers should be applied to skill challenges. The harsh, unyielding ground makes tracking difficult, as well — again, increasing relevant DCs by 3-5 is recommended. Just as iron from this layer is nearly useless when removed, so, too, does alien metal tend to corrode. Each extended rest taken here imposes a -1 to attack and damage rolls for metal weapons and a -1 to the armor bonus for metal armor, unless the armor/weapon has a power or property with the radiant keyword. There’s three basic classes of inhabitants of the Plains Of Iron. The Hunters: While it might seem that the Plains would most likely attract miners, the most common visitors to the Plains are those who hunt the wolves. 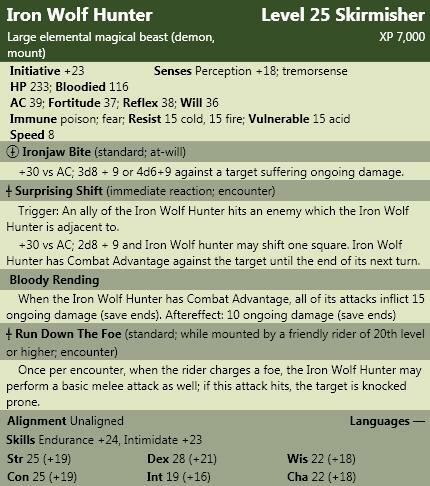 An Iron Wolf can sometimes be tamed as a mount, and the wolves who feed on the souls of the damned can be forged into useful weapons and armor, provided they’re captured when newly gorged. The Plains of Iron is a relatively "safe" staging ground for further adventures in the Abyss — though the sudden shifts in weather, hunting packs, and packs of hunters means that caution must still be maintained at all times. However, the most likely source of adventure is hunters seeking guards and guides to aid them in capturing the wolves. Since the iron wolves will only serve an evil master, either the adventurers must be comfortable with this or they are doing this as part of some plan. It is also possible someone is planning to equip a unit of elite cavalry with iron wolf mounts — and the PCs must stop them. Another option is that somehow, perhaps by a dark ritual, an innocent soul has been sent to this plane, and must be found before the trauma of constant attack, rending, and reformation drives it mad. The chaos of the Abyss is all encompassing. On the Plains Of Iron, the chaos takes the form of sudden, astounding, shifts in weather, from deadly blizzards to blazing flames. These extremes do no harm to the metal of the plane, of course, but living beings caught in them are not so fortunate. A DM may simply decree such a storm has manifested, or he may make one round’s exposure to a storm the consequence for each failure in a survival-type Skill Challenge. Hazard: A blizzard of freezing rust will encompass an area larger than the battlemat, and will last for 2d6 rounds. Perception: A DC 31 Nature check will give a round’s warning that a blizzard is coming. Every additional 5 points by which the check is made will grant another round of delay. Additional Skills: Arcana Knowledge of the planes can also help. A DC 30 Arcana check following the Nature check will give one more round. Secondary Attack: +28 vs. Reflex, only vs. non-slowed targets: Target is slid 1d6 squares in a random direction. Countermeasures: If no shelter can be found, each round of time to prepare reduces all attack rolls made by the storm by 1. Effect: After the first round, all terrain becomes Difficult and vision is reduced to 5 squares. After the third round, all terrain costs 4 squares to move through and vision is reduced to 1 square. After the sixth round, a DC 25 Athletics check is required to move, and each square still costs 4 squares even if the check is made. Flight speed is reduced to 0 during the storm. The air begins to grow hazy and distorted. Sweat begins to form, and the already-dry air becomes dryer still, parching the lungs with every breath. It becomes instantly, painfully, evident that the iron of the plains beneath your feet is heating up, blistering you even through your boots and armor. Desperately, you seek some shelter, but where can you hide when the ground itself has become a searing griddle? Hazard: A searing storm will encompass an area larger than the battlemat. Perception: A DC 32 Nature check will give 1 round’s warning that a searing storm is coming. Every additional 5 points by which the check is made will grant another round of delay. Additional Skills: Arcana Knowledge of the planes can also help. A DC 31 Arcana check following the Nature check will give one more round. Attack: +27 vs. Fortitude; 4d6+9 fire damage, and target loses a healing surge unless they can make a DC 28 Endurance check. Countermeasures: Not being in contact with the suddenly superheated metal of the Plains helps… a bit. Reduce damage to 3d6+6 for any creature which is flying. Special: The attack is +3 against anyone wearing metal armor.